WASHINGTON (CNN) -- After promising the American people his team has already found $2 trillion in budget savings by scouring the federal budget, President Obama laid out some of the potential spending cuts in great detail when he unveiled his first blueprint on Thursday. 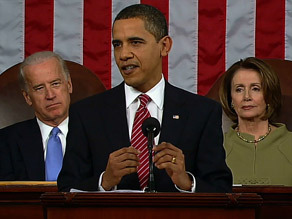 President Obama told Congress on Tuesday that his administration had found $2 trillion in cuts in the federal budget. "My administration has also begun to go line by line through the federal budget in order to eliminate wasteful and ineffective programs," Obama said Tuesday in a speech to a joint session of Congress. "We have already identified $2 trillion in savings over the next decade." A list of some of the proposed spending cuts shows that the programs on the chopping block range from outdated farm subsidy programs to pricey Pentagon weapons programs and the so-called "carried-interest" loophole on Wall Street. Each program, however, has political patrons on Capitol Hill who will fight to save the budget items, setting the stage for major political battles as the details of the budget are debated by lawmakers in the months ahead. For many years, most hedge funds have operated on a "2-and-20" basis, meaning they charged 2 percent of the amount they were managing and also received 20 percent of whatever profits the hedge fund made in a year. However, they pay a much lower capital gains tax rate on that 20 percent or profits -- or "carried interest" -- even though they are not risking their own money. Some say the hedge fund managers are risking their own money and deserve to pay the lower capital gains tax rates on the profits. But others say hedge fund managers are not risking their own money to get that 20 percent of profits, and that the 20 percent going to the fund managers is just a fee and should be taxed as ordinary income. This 20 percent gain will be taxed as ordinary income under the Obama plan beginning with income earned in 2011. iReport.com: What are you giving up? Meanwhile, an antiquated navigation system President George W. Bush saved from death last year is back on the chopping block. Obama says he will kill the LORAN-C long-range navigation and timing system, saving the government $190 million over five years. Just one year ago, the Bush administration announced it would keep the ground-based LORAN system operational to serve as a backup for the satellite-based global positioning systems, which are becoming ubiquitous in cars, planes and ships. Supporters of LORAN say the nation's increasing reliance on GPS has ironically increased the importance of maintaining LORAN as a backup. Having LORAN in reserve makes the GPS satellite system a less attractive target for terrorists, they say. Of the approximately 950 people who commented in the Federal Register about the future of LORAN as the Bush administration's decision was being made, the vast majority favored saving and improving LORAN, said Bob Lilley, secretary of the International Loran Association. The supporters said the system is a near-perfect backup because it provides information similar to that provided by GPS, but has a dissimilar infrastructure. GPS is based on a constellation of at least 25 satellites; LORAN is based on about 25 ground stations in the United States, and others elsewhere. GPS transmits a very faint signal; LORAN has a very strong signal, making it harder to interrupt. GPS is powered by solar panels; LORAN is tied to ground power. And while GPS satellites are unprotected, LORAN operates inside controlled perimeters in the United States, the supporters said. On defense, the administration's list suggests it will target expensive weapons systems but does not specify which programs will be cut or how much money will be saved. White House officials said they are letting Defense Secretary Robert Gates take the lead on specific announcements Thursday. The list did contend the Pentagon's new weapons programs are "among the largest, most expensive, and technically difficult that the Department has ever tried to develop. Consequently, they carry a high risk of performance failure, cost increases and schedule delays." On transportation, a fee charged to every airline passenger to help pay for security would go up an undisclosed amount in 2012 if Obama's proposed budget is approved. Currently, passengers pay $2.50 for every leg of a trip, with a maximum of $5. But the Obama administration said the fee captures only 36 percent of the cost of providing aviation security, and said the increased fee will result in passengers paying "a majority" of the estimated cost of passenger and baggage screening. The airline industry has fought fee increases in the past and is likely to fight this one. "We believe that aviation security is a U.S. government responsibility," said David Castelveter of the Air Transport Association of America, which represents most major airlines. "These costs should not be on the backs of airlines and their customers." CNN's Mike Ahlers, Ed Hornick and Scott Spoerry contributed to this report.